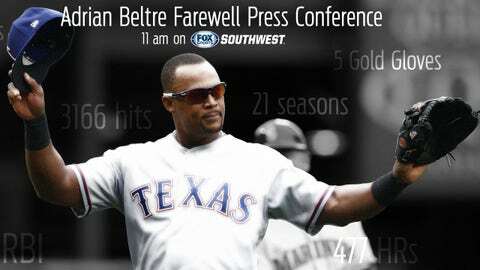 FOX Sports Southwest will deliver live coverage of the Texas Rangers’ press conference for Adrian Beltre on Friday, Nov. 30, at 11:00 a.m. CT. Dana Larson and Mark McLemore will anchor the network’s live broadcast in studio, with Dave Raymond, CJ Nitkowski and Emily Jones providing insight and updates throughout. Beltre, who officially announced his retirement Nov. 20 after 21 seasons in Major League Baseball, collected 3,166 hits, 477 home runs and 1,707 RBI in 2,933 career games. He was a four-time All-Star, five-time Gold Glove winner and the first Dominican-born player to collect 3,000 hits. The press conference will also be streamed live on the FOX Sports app. Available to iOS and Android devices, the FOX Sports app provides live streaming video of FOX Sports content along with highlights and instant alerts for scores and key plays. Fans can download the mobile app for free from the Apple App Store and Google Play. Streaming on the FOX Sports app is also available on connected devices, including AppleTV, Android TV, FireTV, Roku and Xbox One. FOX Sports Southwest is the exclusive regional broadcast partner of the Rangers, with coverage reaching over 10 million cable and satellite TV homes in Texas, Oklahoma, Arkansas and Louisiana.